Visual perception is critical to academic success in many areas. Reading, geography, math, art and art history, foreign language literacy, and the sciences are just some of the subjects that rely heavily on visual discernment. Below, we've described some games that are so much fun, kids will have no idea they’re actually building their visual skills! When reading aloud, it is common for students to substitute a visually similar word (for example, “from” instead of “form”). This can happen to inattentive readers or to readers with poor sequencing skills. Another possibility is that the student needs to build his/her visual acuity. Visual perception is clearly an important skill in reading, and it is not necessarily related to the quality of a student’s eyesight. A child with 20/20 vision may still have difficulty perceiving clusters of letters accurately, which suggests that s/he needs to strengthen cognitive skills like visual acuity and spatial reasoning. Luckily, a simple board game can help. On the Dot is recommended by expert reading instructor Al Moore to help students strengthen both visual acuity and spatial reasoning in a fun way. Play is simple: After looking at a card with a configuration of dots on it, players stack a series of transparent cards, each printed with their own dots, to recreate what they see on the card. The first to accurately copy the pattern on the card is the winner. Single players may time themselves to determine how many patterns they can replicate in five or ten minutes. Fluent readers rely on their visual memories to read words, and most of us use the same memory function to check our spelling. 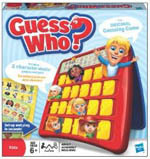 To improve this cognitive skill, as well as to give any student, regardless of learning style, a serious higher-order thinking workout, try playing Guess Who?. This old favorite seems to have fallen by the wayside, but it deserves a resurgence. In this two-player game, each player privately selects one of 20 characters. Then players take turns trying to guess the identity of their partner’s character through a series of yes/no questions designed to eliminate possibilities. Though most people would hardly call this game educational, in fact it is great for developing important cognitive skills used in reading. To play, one must look at a variety of visual stimuli and determine what is similar about them and how they differ, the same way a proficient reader can identify a word at a glance because of its visual characteristics. It also reinforces listening comprehension, particularly at the sentence level, and short-term and active working memory. Guess Who? provides both the medicine - a hefty dose of cognitive strengthening - and the spoonful of sugar to help it go down. Seeing Stars – not your average board game – is designed specifically for reading instruction. Its price tag is considerable, and your family is unlikely to play this game around the kitchen table on a Saturday night. Still, it is enjoyable for children and has been demonstrated to be effective in helping them improve the cognitive areas critical to reading. Seeing Stars, a game developed by the famous reading program Lindamood-Bell, encourages children to latch on to the reading process in a non-traditional way. The programs at Lindamood-Bell are heavily visual, guiding children to learn the shapes of words and the letters within them rather than processing words letter by letter. This is an effective approach for children who struggle with phonemic awareness and phonology. Consequently, Seeing Stars is all about mental imagery. In this game, a student is asked to visualize a real or nonsense word, then alter it by transposing, removing, adding, or substituting letters to form new words. For students who must memorize orthographic patterns in order to spell - in other words, students who cannot “sound out” words in order to spell them - this process helps students form a strong, mental image of words that can easily be recalled later during reading and writing tasks. Seeing Stars may not replace Monopoly as a family favorite, but its value goes far beyond entertainment. A great learning to read game is Stackers. A dictionary is included. A large number of pink and blue tiles are laid out on the table. Each player takes a turn taking one pink time (prefix) and one blue time (suffix). If a word can be made, then the person continues his/her turn. It's fun, entertaining and competitive but most of all, it helps everyone decode and read better.